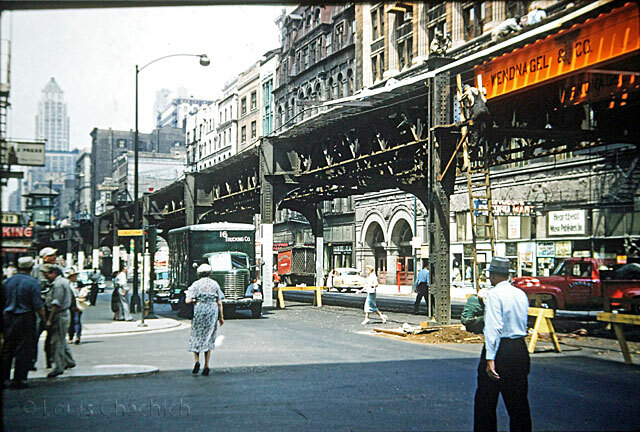 This is a Chicago street scene that my father took in 1955 (or 1956). He didn’t take a lot of street shots like this but probably the track work on the elevated train tracks caught his attention. Notice the guy climbing a ladder and men above him on the track. I thought it would be very difficult to find the location but when I zoomed in on the far side of the ladder, I could make out a shop called Seymour’s Record Mart next to Heartbeat Music Publishers. Turns out this shop which was located at 439 S. Wabash and its owner Seymour Schwartz were at the root of some significant history in the Chicago jazz scene. I’m not sure what the skyscraper is in the distance. Here’s a modern view from a similar vantage point using Google streetview. As you can see, the (Roosevelt University Auditorium) building has been rebuilt but the architect kept the double arches on the far side to maintain some of the history.